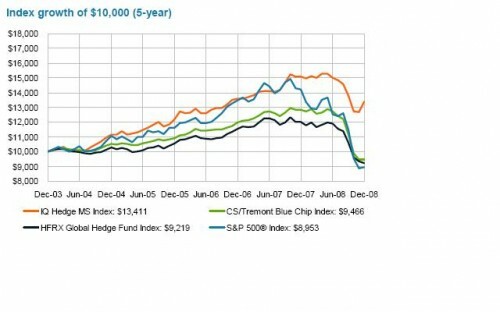 Hedge Fund ETF - Will the Performance Live up to the Hype? Hedge Fund ETF – Will the Performance Live up to the Hype? While most hedge funds have taken it on the chin during the economic downturn almost as badly as equity bourses, it was only a matter of time before a Hedge Fund ETF was launched. I just watched an interview with the CEO of IndexIQ on Bloomberg. This is the first launch and apparently, it performed quite well, exchanging over 100,000 shares. The ticker symbol for the IQ Hedge Multi-Strategy Tracker ETF is QAI. According to a company press release, the QAI investment objective is to “seek investment results that correspond (before fees and expenses) generally to the price and yield performance of its underlying index, the IQ Hedge Multi-Strategy Tracker Index”. The ETF will have an expense ratio of .75%, which is obviously more desirable than the 2% of assets and 20% of profits that has become the industry norm for hedge funds. However, whether or not this hedge fund ETF can actually deliver the low correlation/outsized returns synonymous with the hedge fund industry. 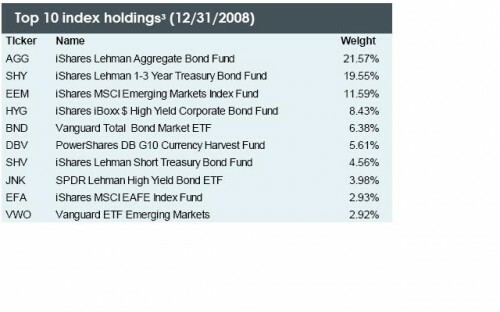 After decades of mythical returns from hedge funds, seemingly outperforming all other asset classes with low correlation to boot (in retrospect, how much did Madoff’s fund contribute to the lore? ), the masses who couldn’t qualify for the typical $2Million net worth/$200K Income requirements had to idly sit by with “investment envy” as the privileged crowd got richer. Now, like the much bally-hood (and critiqued here) Superfund, it will be interesting to see if the instrument will actually deliver returns worth chasing. The underlying holdings are actually an array of ETFs already available to retail investors with a tilt toward fixed income, so it will be interesting to see if it can keep up with a supercharged equities rally, like the 20% Capitulation Rally we just saw over the past 2 weeks. I just question whether this is a conveniently assembled hodgepodge of ETFs that in the right ratio, happened to outperform other asset classes over the past 5 years or whether this can actually deliver. At least with an actively managed hedge fund focused on say, arbitrage or long/short, investors have a shot at a manager timing it right and shorting Financials for a windfall year or getting the commodities play right with leveraged returns as oil runs to $140 per barrel. With a bunch of passive ETFs cobbled together, I’m taking a wait and see attitude on this one personally. So, Disclosure: No position in the Hedge Fund ETF QAI.